Somehow it seems fitting that Graveshadow should unleash its M-Theory debut on Friday the 13th. Not because there is some inherent evil to it, but because it certainly is fitting of the Gothic imagery and overall dark feel of the record. Ambition’s Price is the band’s sophomore effort and the follow-up to their 2015 debut Nocturnal Resurrection (Mausoleum Records). The incredible Dusan Markovic (Jag Panzer, Seven Kingdoms, A Sound of Thunder) created the album’s eye-catching artwork, and Night Demon guitarist Armand John Anthony expertly handled production duties on the album. Ambition’s Price finds Graveshadow trimmed down to a quintet, with former keyboardist Valerie Hudak having departed in 2016. The album marks the recording debut for new guitarist Aaron Robitsch (Crepuscle) who also handled all keyboards for the record. He joins the foundation of vocalist Heather Michele, guitarist Will Walker, bassist Ben Armstrong, and drummer Roman Anderson. Walker founded the band in Sacramento, California in 2012. The group’s sound is fairly broad, but might best be described as American symphonic metal that also blends in elements of progressive power, thrash, and death metal. The album begins with a flurry of keyboards and guitar riffery on “Doorway to Heaven.” The songs offers a nice balance of melody and heaviness. Michele’s harmonized vocals come in and immediately grab the listener. Lyrically, Michele combines her love of Egyptian mythology with her sci-fi passion and an inspiration from the Stargate series. “Widow and the Raven” follows as a mid-tempo journey of spiraling harmonies and crunchy rhythms. The song seems to be about self-reflection and rebirth. It is one of many highlights on the album. The title track is a more dramatic affair, with an almost lumbering feel to it. “Hero of Time” has a classic symphonic metal groove to it, while “Gates” opens with an almost Metallica like sense about it and a chorus that recalls Arch Enemy. Despite this, the song is distinctly Graveshadow, with more shifting melodies and and infectious hooks. While most albums these days feel front-loaded with all the best songs, for my tastes, and in spite of the first half’s exceptionalism, the latter part of the record may be even better. “The Unspoken” begins with a rolling guitar riff and cinematic keys. Michele aggressively attacks with snarling growls on the verses. She returns to clean sweeping vocals for the chorus. Armstrong’s muscular bass lines reverberate throughout the emotive semi-ballad, “Return to Me,” while a sense of torment feeds the cinematic ethos of “Slave.” The pace quickens for the rapid-fire riffing of “Liberator,” which has more of that Egyptian flavor to it. “Warchief” is perhaps the most traditional metal style cut on the record, featuring wailing fretwork from Robitsch, punchy riffing from Walker, and pummeling drums from Anderson. There is an energetic bounce to Michele’s vocal delivery and is instantly addictive. The album closes out with “Eden Ablaze” which comes in like a lamb and goes out like the proverbial lion. Armstrong’s bass is a resonating presence that rumbles in the listener’s chest, and some of Michele’s best harmonies are present here. 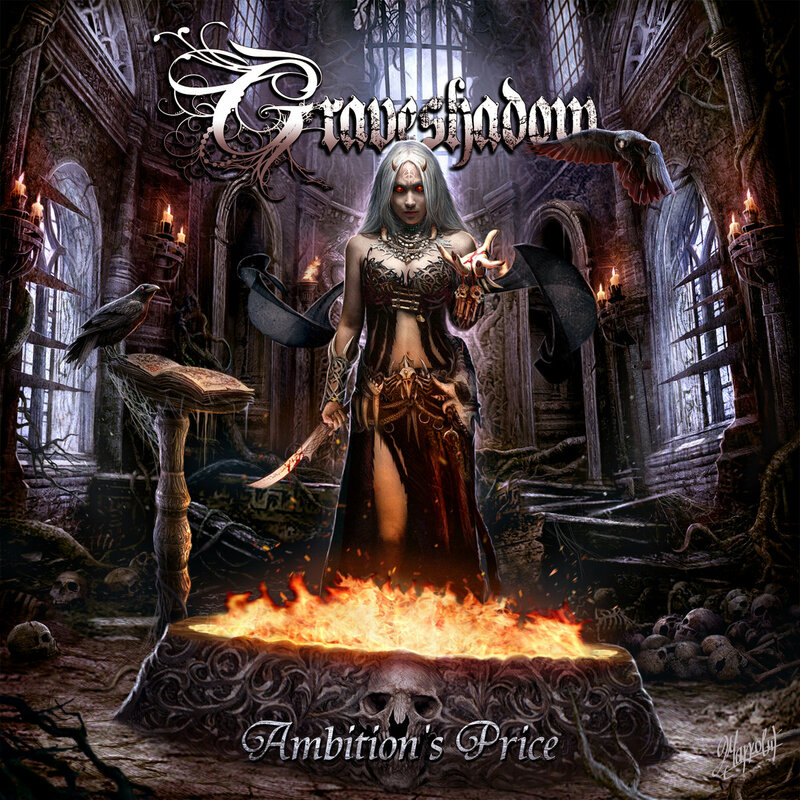 If this is the price for ambition, I’m sure glad that Graveshadow paid the fee, because this is not simply a fantastic record, but legitimately one of the best of 2018. With Ambition’s Price, Graveshadow has taken what has become a somewhat complacent and stagnant style of metal and breathed fresh life into it, creating something vibrant and memorable. Graveshadow has captured a dark magic on Ambition’s Price, and Armand John Anthony helped them masterfully in that pursuit. If you have yet to discover Graveshadow, this is the time of revelation.